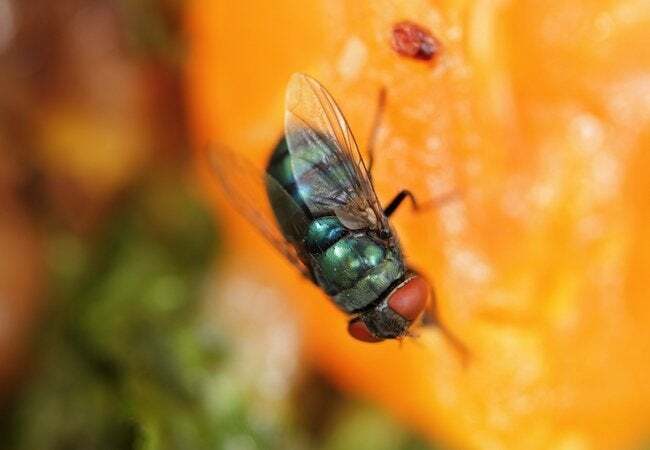 Fruit flies driving you mad? Get rid of them for good by using common sense and some simple home remedies. A terrific way to maintain good health is to stick to a diet chock-full of fruits and vegetables. But few things spoil the appetite more quickly than a cloud of flies lingering over the fruit bowl. Sometimes it seems like these tiny pests are everywhere in the kitchen—garbage disposals, hovering around sink drains, and near potted plants. It only takes 8 to 10 days for a fruit fly egg to hatch into a full-fledge fruit fly, which can make the problem more difficult to control. Fortunately, there are several effective, natural remedies to get rid of fruit flies. You can keep them at bay, even during the height of summer, with the following time-tested tips and tricks. • Don’t bring home any fruits or vegetables that are bruised, as these often contain fly eggs or larvae, which will just increase your pesky bug problem. • Store soft fruits in the fridge in a paper bag. You can keep hard-skinned fruits on the counter in the open, so long as they haven’t ripened to the point of softness. • Being that garbage cans and recycling bins are fruit fly breeding grounds, it’s recommended that you empty and clean these containers as often as you can. If possible, clean them on a daily basis—food and drink spills have a tendency to hide on the bottom or sides of garbage cans, so be thorough. • If you store containers of condiments (for example, ketchup) and cooking essentials like balsamic vinegar in your kitchen cabinets, make sure to keep the jars’ rims and lids clean. Store these products in the fridge if there’s room. • Wipe down counters and eating surfaces promptly after mealtimes, leaving no food source or drink residue that might attract fruit flies. • If you don’t have the time to clean dishes and utensils immediately after you use them, then make sure to place them in the dishwasher. • Clean sink drains with a bottle brush and a grease-cutting cleanser, followed by a hot water rinse. Do not pour bleach down the drain as this does not effectively clean it and can be harmful. • Launder dish towels and hand towels regularly. • Dry your mop thoroughly after you’ve finished with it—this is a common breeding ground for fruit fly eggs or larvae. • In the summer, try to keep your windows shut. Of course, if you want to crack them open for fresh air, make sure to use fine-mesh window and door screens to prevent fruit flies from gaining entry. Oh, no! Despite your best efforts, fruit flies have found their way into your house. You’re surely annoyed, but the situation need not persist. There are various methods that work to catch and control the fly infestation. Try this fruit fly trap: Fill a small container or an empty soda bottle with a teaspoon of apple cider vinegar, two tablespoons of water, and a few drops of fruity-smelling dish soap. Place the container in the kitchen near where the pests have been most active. Fruit flies are highly attracted to vinegar and will fly straight to it. Although you may need to refresh the trap nightly for a period of three or four days, you won’t have to wait long to notice that the fruit fly population has dwindled or disappeared. Alternatively, drop a piece of rotten fruit into a glass jar. Next, puncture the pointy end of a cone-shaped coffee filter and place the filter on top of the glass jar. Flies will smell the fruit and fly straight through the hole to pursue the food into the jar only to end up trapped by the filter. While the fruit flies are smart enough to fly into the trap, they don’t know enough to fly out. Release your prisoners outdoors, repeating the process as often as needed. An equally effective trap is placing a piece of rotten fruit into a bowl of red wine or red wine vinegar. Cover the bowl with plastic wrap, then use a fork to poke very small holes through the plastic. So long as those holes you make aren’t overly large, the flies won’t be able to escape. Keep in mind, too, that rubbing alcohol kills fruit flies more or less instantly. If things have gotten out of hand—or if you feel like doing a little hunting of the little buggers at home—fill a spray bottle with alcohol and direct it toward any hovering fruit flies you encounter. Don’t get any of the alcohol on your fruit, though—it causes fruit to spoil. Now that you’ve gotten rid of fruit flies, it’s time to tackle other household pests. Check out this video on common mistakes that invite bugs into your home.